Movies are designed to take us out of ourselves. The fundamental differences among motion pictures are where they take us. Cloud Atlas, insofar as what time period it is set in, pulls as far back from human existence as I remember a movie ever doing, and takes us somewhere that requires a vantage point in a time that is … I’m not sure where. It’s not just set in early history, the 19th century, the early 20th century or even three-quarters into the 20th. It’s also not just in 2144, the year where much of this rather grand film occurs. Watching “Cloud Atlas,” one sees all these times in its characters’ lives — past, present and future. The viewer takes away the message that there is a connection, occasionally seeming simultaneous, that runs though them all — across an even vaster gulf of time that one could argue is beyond the concept of duration. “Cloud Atlas” and its award-winning author, David Mitchell, are onto something called Eternal Recurrence. That’s the “where” that “Cloud Atlas” wants you to be taken to. As another requirement for being taken away, the movie is a multi-genre motion picture, and the same actors play more than one role. Check out these players for their character count: Tom Hanks plays six; Halle Berry performs six; Jim Broadbent, five; Hugo Weaving, six; Jim Sturges seven; Doona Bae, six; Ben Whishaw, five; Keith David, four; Susan Sarandon, four and Hugh Grant does six. Tom Hanks and Jim Broadbent. “Cloud Atlas” is an action movie, an adventure, a cultural drama of history, using science-fiction and all the computer-generated visuals at hand for that kind of an extra kick. (Remember, some of it happens in 2144 — in a Seoul, South Korea, that in the film appears quite “1984ish.”). 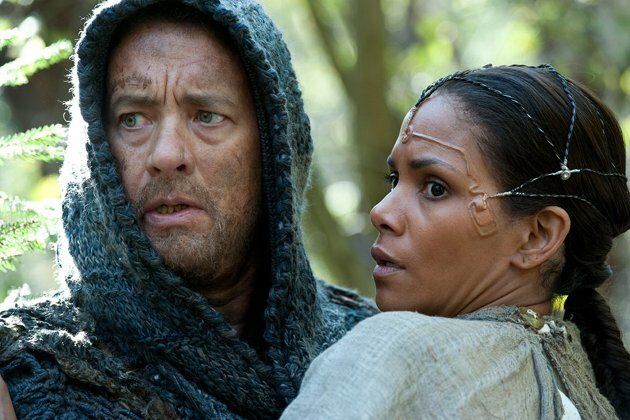 “Cloud Atlas” is as politically charged as any film I’ve seen this year. Mitchell has employed even more than one writing style to push his work forward. “Grandiose” is not too immense a word to use to describe the 500-plus page book. But, getting it all together for a book, and especially a movie, couldn’t have been easy. I’d guess Mitchell has made it about as “easy” as possible for his readers, but the movie script for “Cloud Atlas” is something else. The novel more sequentially tells the six different “Cloud Atlas” stories that magically mesh. The screenwriters, who are also the directors — Tom Tykwer, Andy Wachowski and Lana Wachowski — dissolve the sequence into a clever embellishment that blurs it all to a semblance of simultaneity, which sometimes does and sometimes doesn’t work well. Nonlinear films are in vogue, however. They are catchy, especially so for anyone who enjoys solving puzzles or finds fun in undoing layers of information to get at what the work is saying. 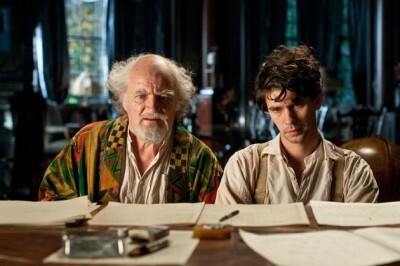 Jim Broadbent and Ben Whishaw. Despite the complexities of the script and actors playing multiple roles, “Cloud Atlas” comes through with what is most important: what it’s driving at, and delivering its message. Language and a few actors’ voices are responsible for some misunderstanding. Accents and archaic speech and patterns of speech also make it difficult to pick up all that is said. There are few subtitles, so nearly all parts of the film demand that you listen. 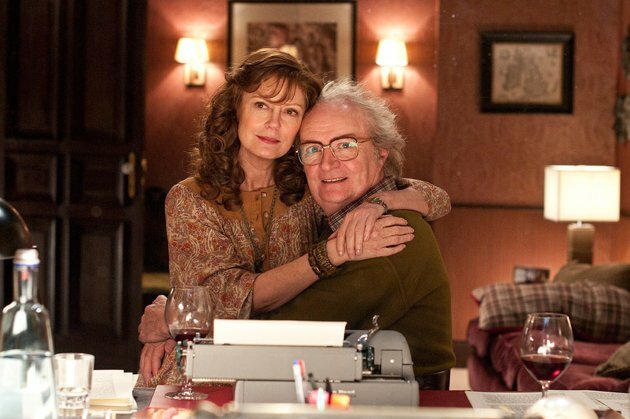 The blade of the cutting edge of “Cloud Atlas” is bright and shiny … and finely honed. It could be David Mitchell wants someone to learn that the concept of Eternal Recurrence might exist and, possibly, that a better appreciation for it would be key in lessening chances those same mistakes are made yet again.